MAY 1ST, 2018 UPDATE – ANNOUNCING THE FOURTH PHASE OF THE TAX CERTIFICATE PROGRAM ! 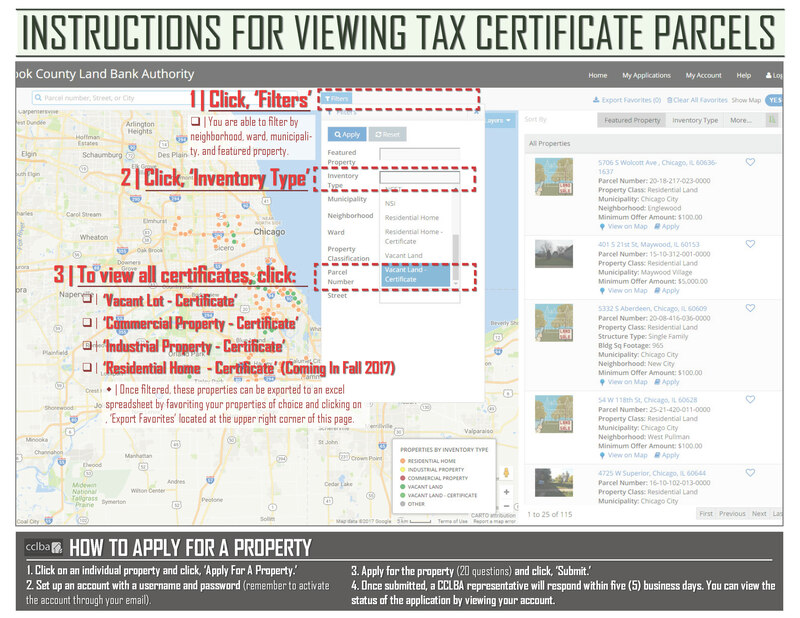 The Cook County Land Bank Authority, on behalf of CCLBA Chairwoman Bridget Gainer and Cook County President Tony Preckwinkle, is excited to announce the fourth phase of the Land Bank’s Tax Certificate Program! Click here for the official press release, which details the release of nearly 3,200 vacant parcels across Cook County and City of Chicago. A summary of properties in this latest phase can be found by clicking here, and illustrates a breakdown by neighborhood and municipality. The first phase, launched on February 1st 2017, involved the release of ~4,300 vacant, tax-delinquent parcels located in predominantly CCLBA Focus Communities. The second phase, launched in the spring of 2017, focused on the release of 385 parcels that are commercial/industrial storefronts and warehouses.. The third phase in October 2017 focused on the release of ~2,000 vacant and unoccupied residential homes and lots located throughout Cook County. The CCLBA plans a fifth and sixth phase of the program which will be released sometime in the fall of 2018 (commercial/industrial properties) and spring of 2019 (residential homes), so stay tuned! If you wish to apply for a parcel(s), please go to our Interactive Property Viewer and follow the standard procedures to apply for a CCLBA property. 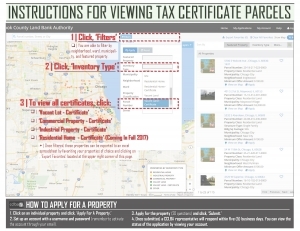 Comprehensive instructions for viewing all parcels & applying for a property can be found in the graphic below. All properties will be evaluated in the same format as any CCLBA property. 3. Click on the drop down for, ‘Inventory Type.’ To view any or all certificates, you have the ability to click: (1) Vacant Lot – Certificate, (2) Commercial Property – Certificate, or (3) Industrial Property – Certificate. You can further filter by neighborhood, municipality and ward if so desired. 4. Apply for a property by viewing an individual property and clicking, ‘Apply.’ You will need to create an account before applying for a property/parcel. 5. Once submitted, a CCLBA representative will respond to your application within five (5) business days. You can view the status of all applications by logging in to your personal account. 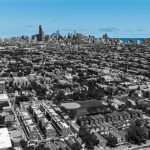 If the vacant lot is located within the City of Chicago and you currently reside outside of the ward you are attempting to purchase the lot, you may be required to provide a letter of support from that local alderman to supplement your application. In the same vein, if you live outside of the suburban municipality you are looking to acquire property, you may be required to provide a letter of support from the municipality as well. It is not required at the time of the application(s), and further instructions will be given upon completion of the application(s). Regarding the timeline, once an agreement is reached it can take up to nine (9) months for the Land Bank to acquire the property. This is due to the fact that the CCLBA does not currently own this property and needs to perform additional steps in order to take this property/parcel to deed. For each successful application, you will be required to sign a terms sheet, which will outline the terms and conditions for acquiring the parcel. For vacant lots, a $500.00 non-refundable deposit will be required, which will count as a credit towards closing contingent on the sale of the parcel. A $1,000 forgivable mortgage will be placed on the parcel(s) at the time of closing. The forgivable mortgage is to ensure that the purchaser maintains the property in compliance with all local building and property maintenance codes and hold title throughout the mortgage term. The mortgage will be be automatically released after thirty-six (36) months if all conditions have been satisfied. All outstanding and delinquent taxes will be forgiven on these parcels up until the time that the property is conveyed, and the new owner will be responsible for the property taxes on a go forward basis. Due to the tax code, if you are the current owner and/or associated with the current owner of a particular property, you are ineligible to apply for that property. The central mission of the CCLBA lies in identifying vacant & abandoned properties throughout Cook County, and putting those properties back into productive use. In an attempt to revitalize and effectively reboot distressed neighborhoods, the Land Bank is making available properties that have been tax delinquent for a number of years. These parcels have essentially been abandoned and have long been eyesores to their respective community. What’s more, these parcels are near impossible to redevelop given the back taxes and fines imposed on the property that more often than not exceed the value of the property itself. Through this program, the Land Bank as a municipal agency is looking to effectively level the playing field in these communities and extinguish the outstanding tax amount so that an individual or organization who has a plan for putting these properties back into productive use has a clear path to do so. The Land Bank does not currently own these properties, however we have the option to acquire the property provided that there’s a viable and sustainable plan that benefits the community as a whole. Through these efforts, the CCLBA is aspiring for a neighborhood reboot in an effort to revitalize and restore our neighborhoods and municipalities. In the spirit of our mission, the Cook County Land Bank Authority successfully bid on 7,778 tax certificates offered at the Cook County Scavenger Sale. 4,437 of these certificates are classified as vacant lots, and represent the first wave of parcels published on our website. To view all vacant lots and apply for a property, please click here to navigate to our interactive property viewer. 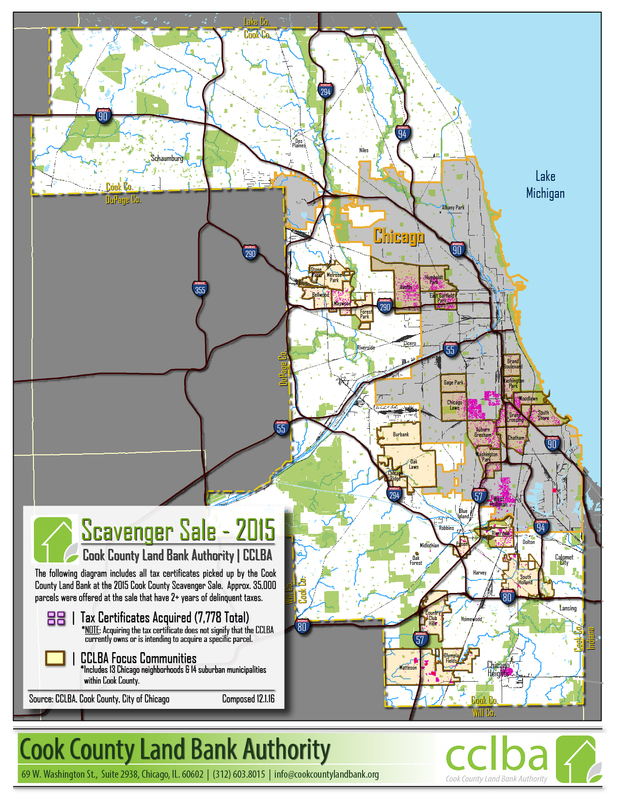 The CCLBA participated in the Cook County Scavenger Sale that was conducted in December 2015. There were 35,457 parcels offered at the Scavenger Sale, many of which were products of the 2008 financial crisis. The Land Bank successfully acquired 7,778 certificates at the Scavenger Sale. These properties/parcels were selected due to the fact that they were located in our focus communities (an outline of the CCLBA’s focus community strategy can be found here) as well as parcels located in census tracts within our target areas. As part of the initial release, the CCLBA has published the first group of 4,437 vacant parcels as of February 1st, 2017. Shown to the right is a diagram of what the CCLBA successfully bid on at the Scavenger Sale, and can be found in an interactive format located here. These certificates were under the assumption that these parcels were abandoned, and therefore unoccupied. The Land Bank is NOT interested in acquiring parcels that are occupied. On an annual basis, Cook County has a number of parcels where the taxes are delinquent. When that happens, the unpaid taxes on these parcels are offered at an annual tax sale, where the general public has the option to buy those unpaid taxes in the form of a certificate. 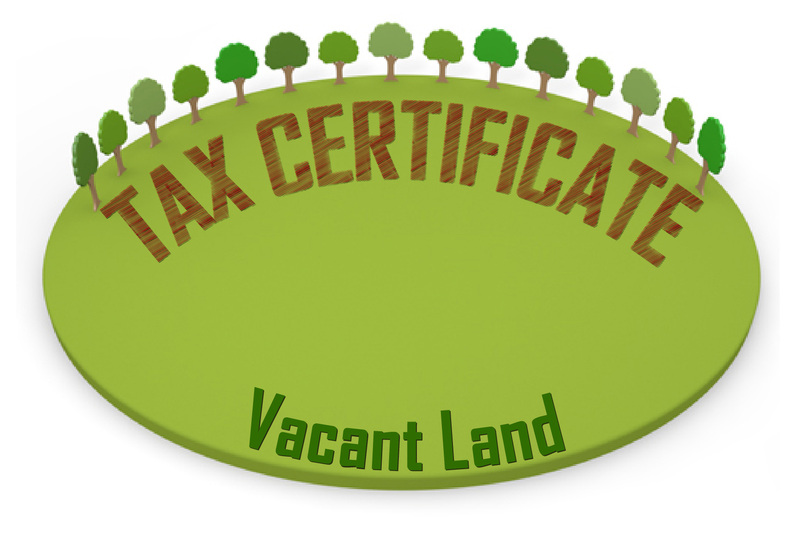 This certificate does not give the ownership to the tax buyer, but it provides the option for the tax buyer to obtain ownership of the property if the current owner has abandoned the property or does not wish to pay the remaining taxes. 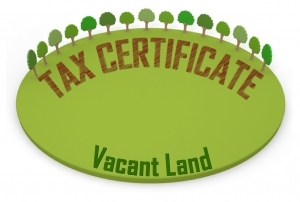 While the certificates for most properties are bought by a tax buyer, there are a certain segment of properties in the County where, due to a myriad of factors (such as the location of the property, amount of taxes due, condition of the building, etc. ), there are a lack of entities willing to purchase the taxes on the property. When that happens for several years, that specific parcel will go to what is called the Cook County Scavenger Sale. 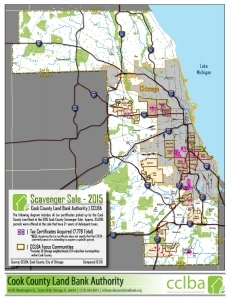 The Scavenger Sale, conducted every two (2) years, consist of parcels of land where the taxes have been delinquent for three (3) or more years, and are thereby considered forfeited. 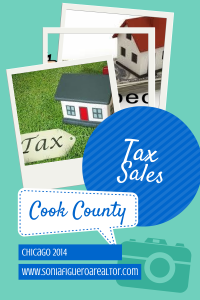 The sale is conducted by the Cook County Treasurer’s Office, and more background information can be found here. Additional information on the policies and procedures of the sale can be found here.